Opera was born in Italy at the end of the 16th century and soon spread throughout most of Europe, an art form that has stood the test of time and still holds a place in modern culture. Three of the most famous came from composer Giacomo Puccini, whose triumvirate of Madame Butterfly, Tosca and La Boheme brought tragedy to the stage and laid it bare for its enraptured audiences. The latter told the story of a group of bohemians who lived together struggling to survive and the love and loss they experienced. Such tragedy has not just been confined to the stage, Many a football club over the years has experienced sorrow, but none more so than Torino. The 1958 plane crash in snowbound Munich that claimed the lives of 23 passengers aboard Manchester United’s British Airways flight en-route from Belgrade brought back all too painful memories for fans of i Granata who mourned the great Il Grande Torino that perished in the mist of Turin. The commander of that ill-fated Italian Airlines flight was Luigi Meroni, who became disorientated by the lack of visibility as the plane descended. Quick as a flash, the Basilica of Superga appeared in front of him and, with no time to pull away, the plane careered into the church’s retaining wall, killing all onboard. The era of Italian football’s greatest side was over yet hope appeared almost 15 years later in the form of another, unrelated Luigi Meroni. A shining beacon in a dark era of calcio, ‘Gigi’ almost single-handedly lifted a club still recovering from their loss, only for him to join the list of greats gone far too soon. Meroni was born in the resort of Como in Lombardy, northern Italy, on 24 February 1943. He was the second son of Emilio and Rosa, raised predominantly by his mother following the death of his father when he was only two. At the time, Italy was in the grips of austerity, the country facing an unknown future after the destruction and defeat of World War Two. The first general election following the war saw the Democratic Catholic Party make inroads in the post-war society and, by 1948, they had won over 48 percent of the public vote. Meroni felt the effects of this and was a regular at church, experiencing a conservative upbringing alongside siblings Celestino and Maria. Yet the young Meroni was different to most children his age; he had a love of painting and expression that saw his mother regard him as something of a free spirit. By the time he was a teenager he had joined his local church, San Bartolomeo’s football team, and worked in a factory making silk ties. In Britain, the swinging sixties had arrived – flower power, free love, rock and roll and carefree thinking were the order of the day. Italy was a world away from that. An economic boom had saved the country from ruin in the 1950s. The car manufacturing industry exploded, bringing swathes of people into the northern industrial heartlands. There was no time for flowers in the hair as Italy thrust itself headlong into stabilising and strengthening their industrial power. By 1961, Meroni had caught the attention of local Serie B side, Como. His rangy frame dazzled on the right wing, the ball glued to his boot as he dribbled in and out of defenders. A steady first season in the Italian second tier saw Meroni make 26 appearances and score three goals as his hometown club finished in a more than respectable 14th place. The intriguing nature of Meroni’s play had not gone unnoticed as that season’s Serie B champions Genoa swooped to add him to their ranks upon their ascent to the top flight. It was a steep learning curve for club and player alike, with i Rossoblu narrowly avoiding relegation. Meroni appeared fleetingly, making 15 appearances and scoring only one goal. The Genoese tifosi remained on his side, however, won over by his attitude to the game and willingness to keep trying to beat defenders, even when they resorted to the typical kicking of the time. His second season in Serie A saw a marked difference as the team threw off their shackles and secured an eighth-place finish. By now Meroni had come into his own, starring in 27 games, bringing his goal tally up to a credible six. It was no mean feat considering Italian football was in the throes of the Catenaccio era, Helenio Herrera’s Internazionale suffocating opposition teams across the peninsula. It wasn’t only on the pitch that Meroni was getting attention; off it, he began to draw the ire of the press. The Beatles shook their mop-top haircuts in front of screaming fans across the world, and the Italian media had noticed that the bearded Meroni had something of the beatnik about him. By their standards, Meroni’s ear length hair may as well have been flowing down his back and, upon selection for Italy B, he was told in no uncertain terms by manager Edmondo Fabbri to get his locks shorn. Meroni refused, much to the indignation of Fabbri and the press – and this wasn’t the only brush with controversy he had that season. The introduction of random drug tests in the Italian game caught three players out who tested positive for amphetamines. Meroni, too, was called but claims he forgot about it, resulting in a five-match ban for the Genoa winger. 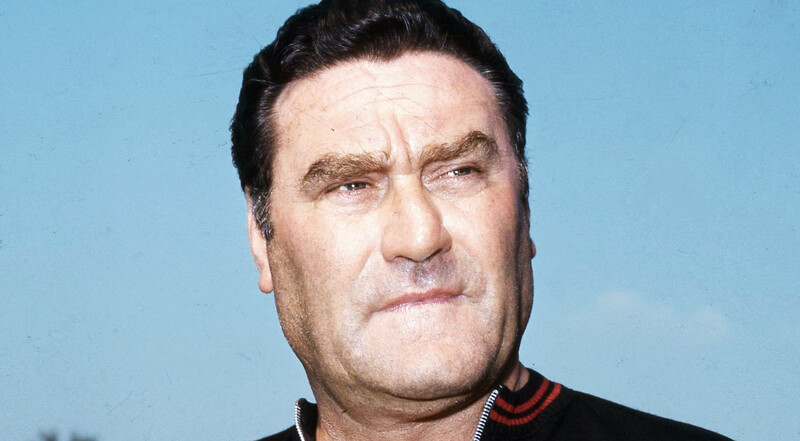 Despite this, his performances on the pitch improved by the game, so much so that before long, Meroni was on the move again, this time to Torino where coach Nereo Rocco had arrived, fresh from leading AC Milan to European Cup glory. The strict disciplinarian was eager to bring success back to Il Toro, who had unsurprisingly stagnated after the Superga disaster and the decimation of a team that won five Scudetti in seven years. Meroni acquired a loft apartment in Piazza Vittorio and spent his time away from the game with his first loves: painting and jazz. His high-profile relationship with Cristiana Uderstadt came to a blinding halt, with his spurned lover running into the arms of an elderly filmmaker and soon the unlikely couple married. It wasn’t long, however, until the young lovers were back in each other’s arms. Uderstadt fled the marriage before it could be consummated yet in a strict Catholic country, a married woman ‘living in sin’ with an art-loving footballer was heavily frowned upon. Torino brought out the best in Meroni, the Stadio Comunale crowds often thrilled with his dribbling runs driving at the heart of the opposition defence. His lightning speed coupled with what had become a trademark chipped shot often caught goalkeepers unaware. With Meroni firing, Toro finished third. The tifosi took him to their hearts, christening him La Farfalla Granata – The Maroon Butterfly – although to some of the older fans he was affectionately known as Calimero, after a cartoon chicken who wore a broken eggshell on his head. His personal style tastes were yet again focused on by the Italian press as they questioned whether his beard signalled links to communism, purely based on the fact that revolutionaries such as Che Guevara and Fidel Castro had hirsute faces. Meroni revelled in the press attention, however, and liked nothing more than playing up to the character they portrayed. One time, along with teammate Fabrizio Poletti, they walked a hen on a lead in the city square and attempted to put swimming trunks on the bewildered animal. He enjoyed his time in Turin, his apartment bedecked in paintings he had produced. With talk of a national team call-up in the offing, Meroni attempted to keep the press off his case by claiming his live-in lover Uderstadt was his sister. Back at Stadio Comunale, the steady rebuild from Rocco was well underway. A slightly disappointing 10th-place finish in Meroni’s second season had seen him play in every match and helped secure his first call-up to the Azzurri squad. Fabbri was now in charge of the senior side and again attempted to get Meroni to trim his hair, however he remained steadfast in his refusal to comply, much to the chagrin of the veteran coach. With the 1966 World Cup in England on the horizon, Meroni got his chance to stake his claim for a place in the squad at his home ground. 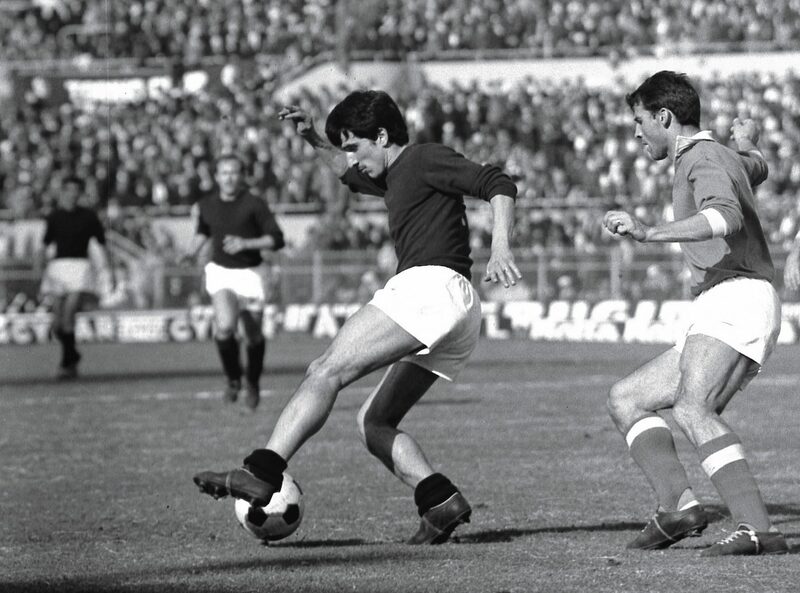 One of the Azzurri’s key men was Sandro Mazzola, son of the late Grande Torino captain Valentino. 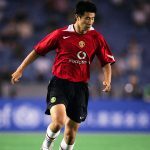 The legendary striker’s offspring had infuriated fans of his father’s team by turning his back on Torino to sign with Inter. 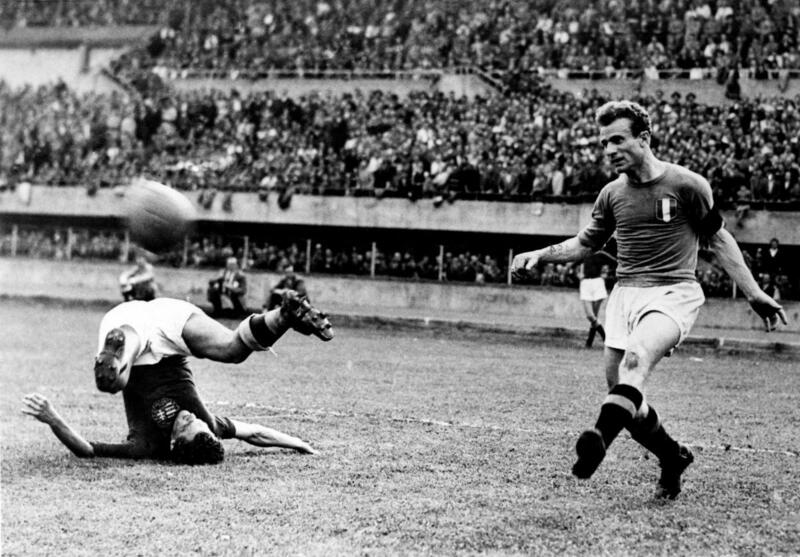 Mazzola was booed and jeered by the home fans during a warm-up game against Argentina, with Meroni replacing him at half-time – much to the delight of the crowd – and going on to score his maiden goal. With that performance, Meroni was named in the squad for the World Cup where Italy were placed in a group alongside Chile, the USSR and North Korea. 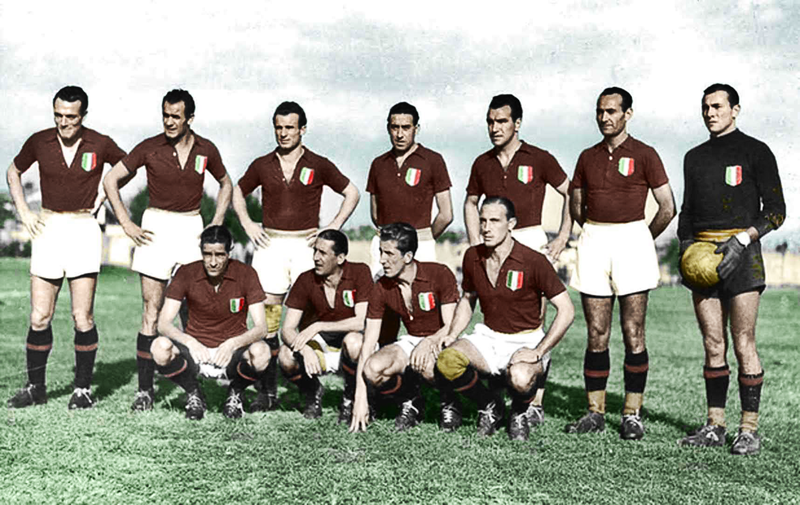 The Torino winger would only appear in one game, however – a 1-0 defeat to the USSR. With group minnows North Korea awaiting in the final game at Middlesbrough’s Ayresome Park, Meroni was left out of the starting line-up, a decision that blew up in Fabbri’s face when Giacomo Bulgarelli left the field injured. With no substitutes permitted, Italy toiled away before a single goal from Pak Doo-Ik gave Chollima victory and one of the World Cup’s biggest shocks as the Azzurri were sent packing. The usual inflammatory Italian press searched for a scapegoat and looked no further than Meroni, claiming his absence from the final game was down to a clash with Fabbri over his refusal to cut his hair. Years later, Fabbri’s diaries revealed that the absence of Meroni wasn’t down to his hair length but more his failure to follow instruction during the USSR game. Tactics bored Meroni, he played on instinct, displaying the same artistic flair with the ball on the wing as he did when he committed paint to canvas. Meroni’s popularity with the Torino tifosi reached its zenith the following March when faced with the straitjacket of Herrera’s Inter. The ball dropped at Meroni’s feet and, with the uncompromising Giacinto Facchetti hunting him down, he scooped it over his head before smashing it past Giuliano Sarti in the Nerazzurri goal. This skill and ability didn’t go unnoticed and soon there was talk of Meroni swapping the maroon of Torino for the stripes of rivals Juventus. A massive offer of 750m lira from La Vecchia Signora was one Torino president Orfero Pianelli couldn’t refuse. What each club didn’t bargain for, however, was the reaction of the Torino fans. Juventus were backed by the financial clout of the Agnelli family, who happened to own the Fiat car company where hundreds of Torino fans worked. When news of the imminent transfer broke, they all declared they would go on strike should any deal for their hero be sanctioned. Further protests outside the homes of both clubs’ owners were the final straw and the deal was called off. Meroni shrugged off all the fuss yet still managed to find himself on the cover of La Stampa after shaving off his beard. Life was good for Meroni: on the pitch he had become a fan favourite – a hero to rival those who died at Superga – and off it, he was settled with Uderstadt, who was waiting to hear that her marriage had been annulled so the couple could finally marry. The news arrived the morning Meroni set off to Stadio Comunale for the visit of Sampdoria. A 4-2 win, coupled with news of Uderstadt’s newly-acquired marital status, saw a jubilant Meroni head into Turin after the game to celebrate with teammate and friend Poletti. The pair were in high spirits as they headed to Bar Zambon on the busy Corso Re Umberto. Despite the road being dimly lit, the duo opted to cross the two lanes of traffic swiftly, where a fast approaching car caught Meroni unaware. He stepped back into the path of an oncoming Fiat, which careered into the Toro winger before another car struck the prone Meroni, leaving him with catastrophic injuries. Poletti had also been injured but remained relatively unscathed. His teammate, however, suffered crush injuries to his chest as well as severe trauma to his legs, pelvis and head. Passers-by rushed to the scene as the sirens of the emergency services wailed across the city. Despite early reports that he would survive, Meroni was declared dead at 10:50pm. Tragedy had returned to Turin. The driver of the car that first struck Meroni was Attilio Romero, a 19-year-old Torino season ticket holder who had himself been at the game that afternoon. A large Meroni poster adorned the wall of his bedroom, and some reports even stated there was a picture of La Farfalla Granata in his car window. He was subsequently acquitted of manslaughter due to the poor visibility on Corsa Re Umberto, yet in a twist of fate, became club president at the turn of the millennium and stayed until bankruptcy decimated Il Toro in 2005. For fans of a club still recovering from the horrors of Superga, the loss of Meroni cut deep. Over 20,000 people attended his funeral, one even going as far as to break into his tomb, unwilling to believe he was dead. 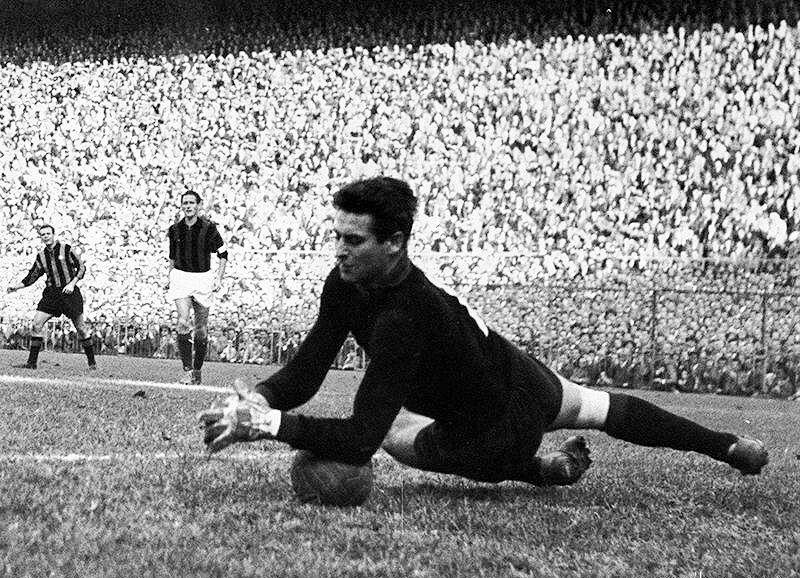 Emotions ran high for the first Derby della Mole with Juventus after the accident, with flowers dropped from the sky onto the right-wing position where Meroni would have played. The Torino stood in revered silence, occasionally breaking it for chants of “Gigi, Gigi”. His great friend and teammate Néstor Combin was adamant he would play in the game despite running a raging fever the night before. There were no doubts of the result that day. Combin rose from his sick bed to net a memorable and emotional hat-trick in a 4-0 win. Fittingly, Alberto Carelli netted the other goal in the number seven shirt that Meroni had made his own during his time at the club. Forty years later, Torino erected a monument in Meroni’s honour on the busy road that claimed his life on that tragic October evening. It’s a lasting memorial for a man as unique as the beautiful insect with which he was associated. A footballer whose refusal to conform brought a splash of colour to Italian football.